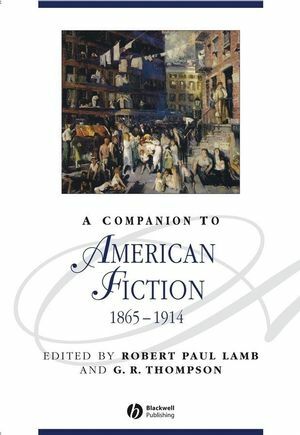 A Companion to American Fiction, 1865-1914 is a groundbreaking collection of essays written by leading critics for a wide audience of scholars, students, and interested general readers. Robert Paul Lamb is Associate Professor of English at Purdue University. The author of many articles on American literature and recipient of Harvard University’s Bowdoin Prize for scholarship, his teaching honors include Harvard’s Stephen J. Botein Prize, Purdue’s University Award for Outstanding Undergraduate Teaching, Purdue’s Liberal Arts Departmental Award for Educational Excellence, and induction into The Purdue Book of Great Teachers. G.R. Thompson is Professor of English and Comparative Literature at Purdue University. His previous publications include the Norton Critical Edition of Edgar Allan Poe (2004), Neutral Ground: New Traditionalism and the American Romance Controversy (1999), The Art of Authorial Presence: Hawthorne’s Provincial Tales (1993), Essays and Reviews ofEdgar Allan Poe (1984), Ruined Eden of the Present: Hawthorne, Melville and Poe (1981) and Poe’s Fiction: Romantic Irony in the Gothic Tales (1973). "All praise to Lamb and Thompson … Comprehensive, well written and carefully edited ... Essential." "The editors have intended the Companion to be an introduction to the field and a reference tool for 'advanced undergraduates, graduate students, faculty members and general intellectuals'. In this they have succeeded admirably."